Q. I used a solar company (not through SolarQuotes® !) and the system they installed is not working properly. They refuse to fix it. Help! A. Here is the best way I know of to get the system fixed. 1. 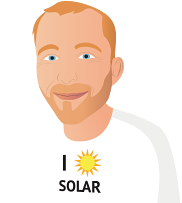 Engage an independent, 3rd party, accredited solar installer to perform a full audit on your system. Expect to pay about $200 for this. 2. Assuming the audit finds the system is not performing as it should, send the Audit to your installer and advise that if they do not give you a plan to fix they system within 5 business days, you will contact consumer protection. 90% of the time this will get them to fix it. 4. Consumer affairs will provide advice on how to resolve the issue. But sometimes they are a bit useless to be honest! If you have no joy, then book in with your local consumer tribunal, using your Audit as evidence. The installer should then be compelled to see you at the tribunal, where an impartial magistrate will decide if they have to fix your system. If it goes this far ensure you make a claim for the cost of the Audit too. You should consider independent legal advice before taking this step. My installer says it's fine to have different roof orientations on the same string. Is he correct?